Prepare to have your mind blown, muscle men (and women). A new study from the University of Stirling has debunked two common beliefs about big muscles and protein. First, that people with more muscle mass need more protein than their less-muscles counterparts (they don’t). For the study, young, resistance-trained men were divided into two groups: One with lower lean body mass (less than 65 kilograms) and one with higher lean body mass of more than 70 kilograms. Each volunteer participated in two trials, consuming protein after a resistance exercise. In one trial, the men consumed 20 grams of whey protein after the exercise and in the second, they consumed 40 grams. Scientists then measured the muscle’s ability to grow after a workout in both groups. They found that people with more muscle mass do not, in fact, need more protein after a resistance exercise than their less-muscled counterparts. This goes against the commonly held belief from most nutritionists and personal trainers that big guys need big protein boosts after a workout. Personal trainers generally agree that those who are trying to bulk up should aim for 1.2 to 1.7g of protein per kilogram of bodyweight every day. 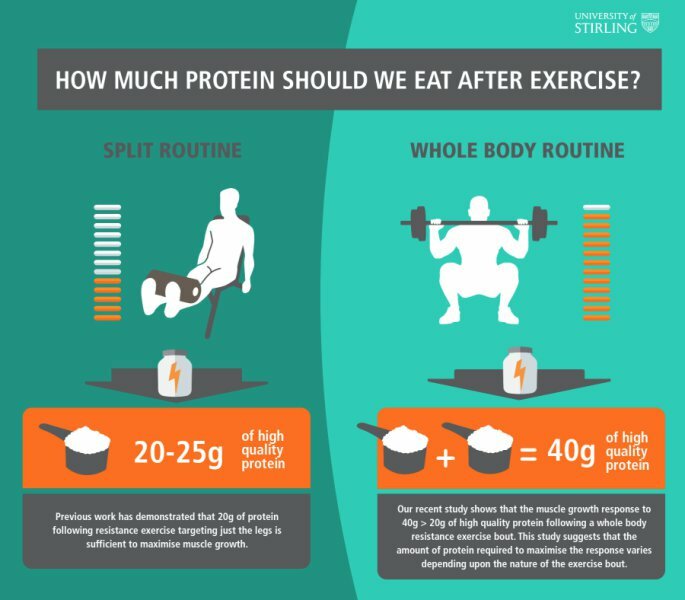 “There is a widely-held assumption that larger athletes need more protein, with nutrition recommendations often given in direct relation to body mass,” said Kevin Tipton, Professor of Sport, Health and Exercise Science in the Faculty of Health Sciences and Sport. Which leads us to myth two. They study also debunked the 25-gram “protein ceiling,” which suggests you don’t need more than 25 grams of protein after a workout. In fact, if you’re performing an intense, full-body workout, you need much, much more than that. As Professor Tipton explained, previous studies on which protein recommendations are based were flawed, because they were based on leg-only workouts. Consuming 40 grams of protein after whole-body routine was found to be much more effective at stimulating muscle growth than consuming 20 grams. This was found to be true no matter what the size of the participants. “Until now the consensus among leading sports nutritionists, including the American College of Sports Medicine and the British Nutrition Foundation, is that weightlifters do not need more than around 25 grams of protein after exercise to maximally stimulate the muscle’s ability to grow,” said Professor Tipton. This throws commonly held recommendations into question and suggests the amount of protein our muscles need after exercise may be dependent on the type of workout performed. “In order for nutritionists to recommend the correct amount of protein we first need to consider specific demands of the workout, regardless of athletes’ size,” Tipton explains. The type of workout you’re doing — and not the size of your muscles — should determine how much protein you need to build size. One caveat in the research is that the results were only limited to younger, trained men, so results might be different amongst older people or women. However, if you’re a serious lifter looking to gain bulk, you may want to up your protein intake following a full-body workout.